Technology has altered the way we live. It has touched every aspect of our lives, including the way we work. No longer do employees need to be confined to their desks to do their jobs. Mobile devices, like laptops and smartphones enable them to operate from any corner of the world that has a decent Internet connection. This advance of technology has also shaped the mindset of a young generation and the way they work. The millennial generation isn’t afraid to go beyond the borders of set office timings to effectively do their job. They adapt a more dynamic work schedule to meet the demands of your clients and business. To train this dynamic workforce, classroom training can prove to be too rigid. Employees usually have to go out of their way to attend classes at a specified time, which may not always be possible. Even if they do manage to attend classroom sessions, there is no certainty of knowledge retention as they only get one shot at grasping the content. Hence, online learning is clearly the way forward for organizational training. For an organization to suddenly jump from a traditional classroom learning setup to a fully digital one might be an unwelcome move. To avoid this abrupt change of methodology, it is best that you first adapt a blended learning approach. Blended learning, as the name suggests, blends the best of classroom training with its digital counterpart. As it often happens with trying to adapt a digital learning approach, it is met by acute resistance from top management. As your organization has always used traditional training methods till now, top management can be very skeptical about parting ways from a tried and tested learning method. Blended learning can ease up this transition by offering an approach that is a little bit of both. It gives top management a glimpse of the many benefits that come with e-learning courses, while still giving them the comfort of a classroom session. If you have been using a solely classroom training approach till now, then your employees can be overwhelmed with learning digitally. Also, since your organization itself is new to online learning, your training program can develop some unforeseen glitches. Combine this with the lack of experience and technical support, and your employees’ learning experience can really take a beating. Blended learning neatly circumvents this by making the entire shift to digital, gradually. In the initial stage, you can only introduce easily manageable microlearning modules that support the main classroom content. Once this reaches its full potential and gets a good response from employees, you can introduce more digital modules. Blended learning allows you to introduce small doses of digital learning elements among your employees. Let’s not forget that providing real-time and relevant feedback is one of the strongest aspects of digital learning. By using feedback data from your short digital modules, you can derive what works best for your target audience. This paves way for a full-fledged digital learning program, as you know exactly what to use and what to avoid. The best thing about going digital is that it comes with an arsenal of innovative techniques to impart effective knowledge among learners. When you start off your digital journey with blended learning, you get a glimpse of that innovation. 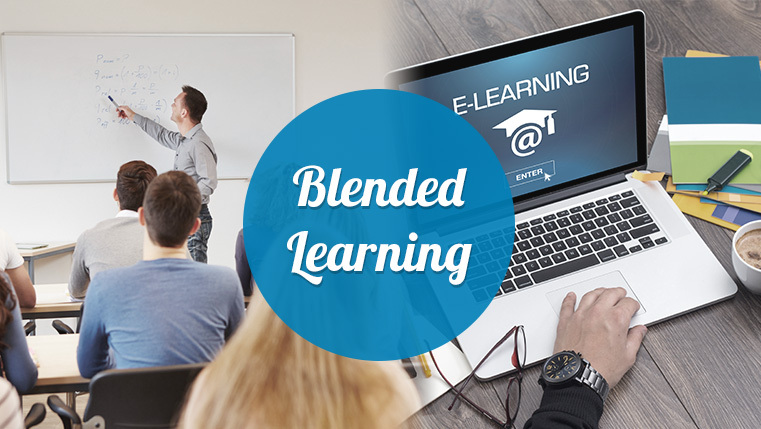 Video, audio, infographics, animations, scenario-based learning, game-based content, and gamification are just some of the engaging elements that can constitute your digital module in the blended learning program. These, when combined with strong instructional design principles, deliver quite an unparalleled learning experience, which can prove to be much more impactful than your traditional learning methodologies. The decision to go digital can be a big one, but it doesn’t mean that you should delay moving in that direction. Blended learning can be a perfect starting point in a long and fruitful e-learning journey.